Looking for a table tennis coach in London? 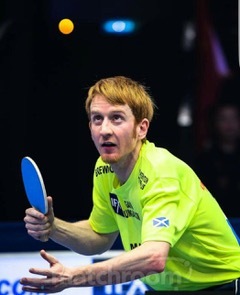 Gavin Rumgay is a professional table tennis player and a former British Table Tennis Champion and twelve times Scottish National Table Tennis Champion. As a junior he was also Scottish National Tennis Champion and was at one stage coached by Judy Murray (mother and coach to Andy and Jamie Murray). Gavins racket sport business is recognised by many as London’s best racket sports coaching business and as such offers elite coaching in Table Tennis, Tennis, and Badminton, as well as Mini Tennis for children. All coaching is bespoke, whether you are beginner or an experienced player. Take this chance through Fitness4London to book a lesson and see your level improve dramatically!